Afghanistan competed in their first notable ICC tournament in 2010 when they qualified for the ICC World Twenty20 hosted in the Caribbean. Since then the Asian nation has improved, and raised it‘s game to a level that no team can consider them minnows in major competitions. The International Cricket Council awarded the Blue Tigers for its achievements in the global field in 2017 when they rewarded Afghanistan with the Test stature along with Ireland. In June 2018 Afghanistan played their first Test match against India in Bengaluru although in a losing effort. Afghanistan made it to the 2019 ICC Cricket World Cup ahead of the much stable and experienced teams of Zimbabwe and Ireland, who used to be present at the sport’s grandest carnival. The team not only booked its place for the mega event in the UK next year but won the ICC CWC 2019 Qualifiers by blowing away former World Cup champions Windies in the decisive finale. The Afghan team won their first ever World Cup match in 2015 when they conquered Scotland in a nail-biting thriller. They would be keen to add some more victories to their kitty and here are the 3 teams whom they can defeat. The team who once won the World Cup and recently also won the ICC WT20, Sri Lanka is running through a never ending bad dream. With all senior players retiring together at almost the same period, the Islanders have been unable to find their replacements. To fill the boots of Dilshan, Mahela Jayawardene and Kumar Sangakkara is a tough job but the cricket fans saw Dinesh Chandimal, Thisara Perera and Angelo Mathews as the rising stars. Somehow, the Sri Lankan team could not recover from the blows that they were dealt with and they may also take the wooden spoon by finishing last at the ICC Cricket World Cup. 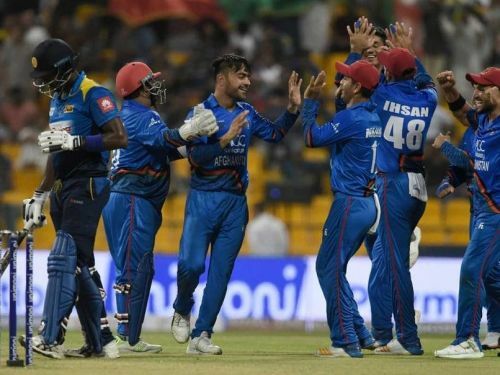 Afghanistan thrashed the Lankan Lions in a group match of Asia Cup and would like to repeat the same in England next year.